We checked in our respective rooms, changed to our swimwear, and boarded our waiting pumpboat. Wooden pumpboats are ubiquitous marine vessels in the Philippines. Bamboo outriggers on both provide balance and stability for the extremely narrow hull, which is designed to slice through waves. Pumpboats draw very little bilge water and float high on the surface, making them ideal for cruising in shallow reefs. Pumpboats can be of any size, from small one-man canoes to ferries that can accommodate around 50 people. All aboard! Once everyone settled down, the boat’s engine roared to life. We started our morning cruise to Pescador Island, which is just a few kilometers away from the mainland. Supposedly, it would have taken us only around 15 minutes to reach Pescador. 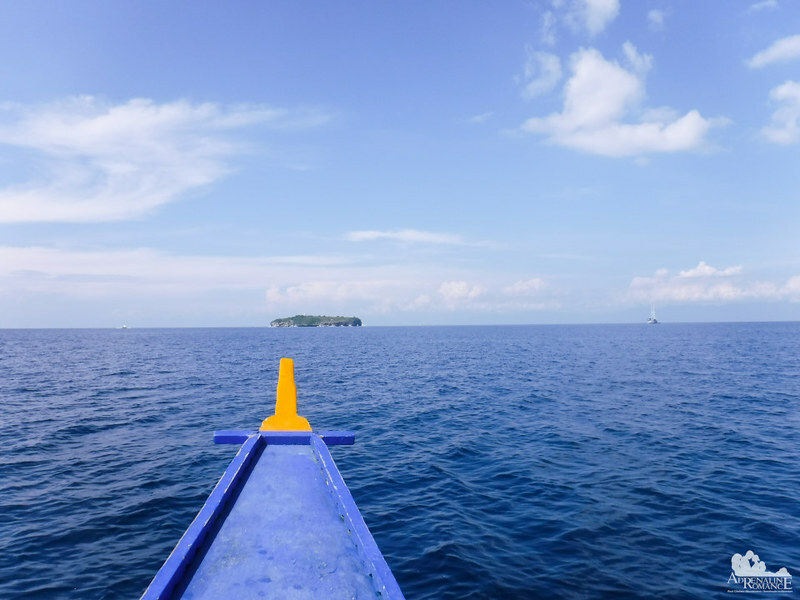 But our boatmen had to deal with a few mechanical issues—thankfully not serious—that made us stop in the calm, deep blue waters of Tañon Strait. We drifted on a very gentle southwestern current. While waiting for our boatmen to fix the engine, we whiled the time away by telling blogging jokes and sharing our adventure stories. Half an hour later, the boat resumed its course. In just less than 10 minutes, we could see Pescador Island up close. Dive boats and other rented pumpboats have already encircled the rocky island even at this early hour. Pescador, in Spanish, means fisherman; and it is an apt name. During the Spanish colonial heritage, local fishermen harvest the bounties of the sea here. 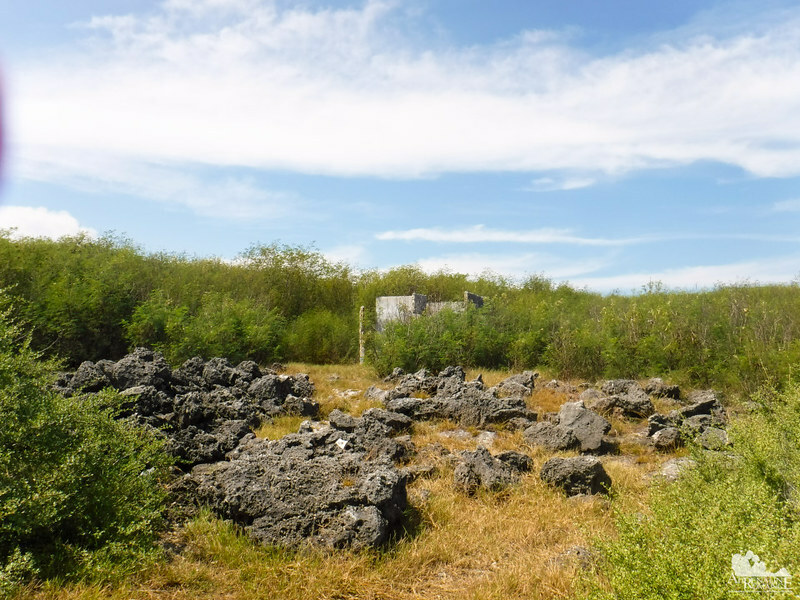 Like many small islands and islets in the Philippines, Pescador Island is made up almost entirely of coral rock, suggesting that it might have been underwater in its early geological life. We have been to the waters around Pescador Island a couple of times, but we have never actually set foot on it. Now, it was our chance. We asked the boatmen if we could go in-land, and thankfully, they said yes! But there is no sandy shore or pier where we can dock. We had to bring the bow of the boat as close as we can to a rocky face. Stepping on to the rock from a rocking boat can be tricky. An old, rock-strewn trail led into the woods not far from where we alighted. 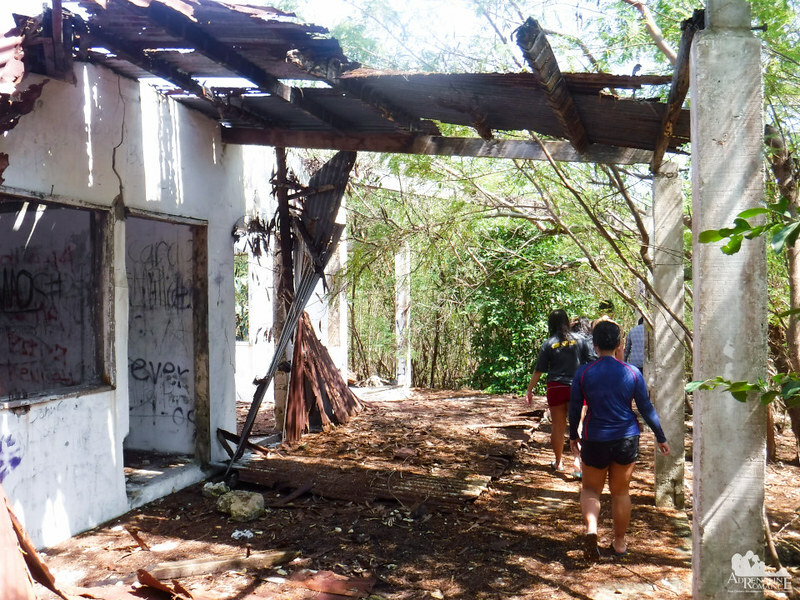 We followed it and came to some dilapidated and vandalized ruins. This was most probably an outpost of sorts where watchmen kept an eye on the strait. What a lonely watch it must have been! Today, the structure is now a shadow of its former self. Right beside the old ruins is a modern solar-powered lighthouse which guides ships that are sailing along Tañon Strait. A wire fence keeps visitors away from the high-tech lighthouse. Vines have entangled themselves in the wire fence, which meant that this unit hasn’t seen a caretaker for a few months. That’s okay because modern, unmanned lighthouses such as these have automatic systems and require little maintenance. We continued our way through the light woods towards the north side of the island. 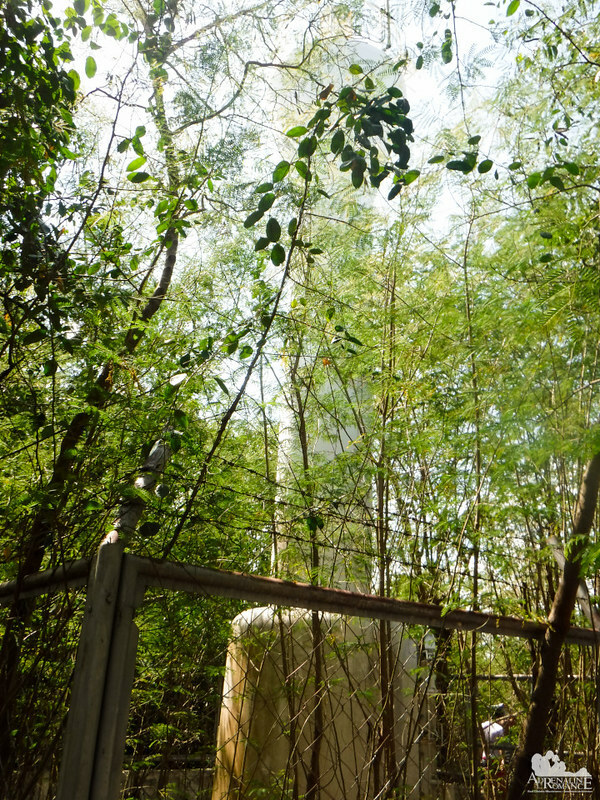 These woods are home to marine birds as well as small reptiles and mammals that inhabit Pescador Island. 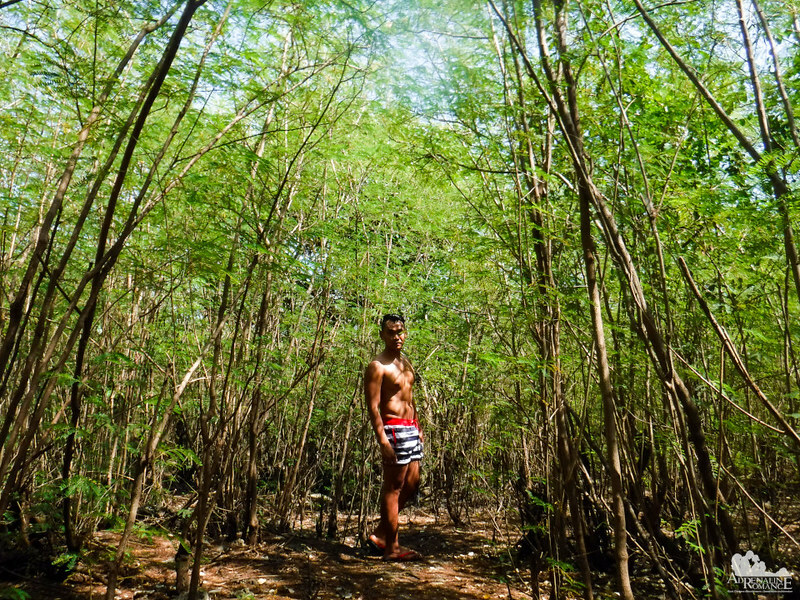 Mark Monta of Face Cebu just can’t resist doing his signature hukas pose right in the middle of the woods. He should have worn a loincloth to portray a forest guardian. Hehehe! Anyway, this area seems to be a nice spot for pictorials. Five minutes later, we came out of the light woods that cover most of the island. Sharp rocks, remnants of corals from long ago, litter the patch of brown grass. Be careful with your steps; these rocks are wickedly razor sharp. 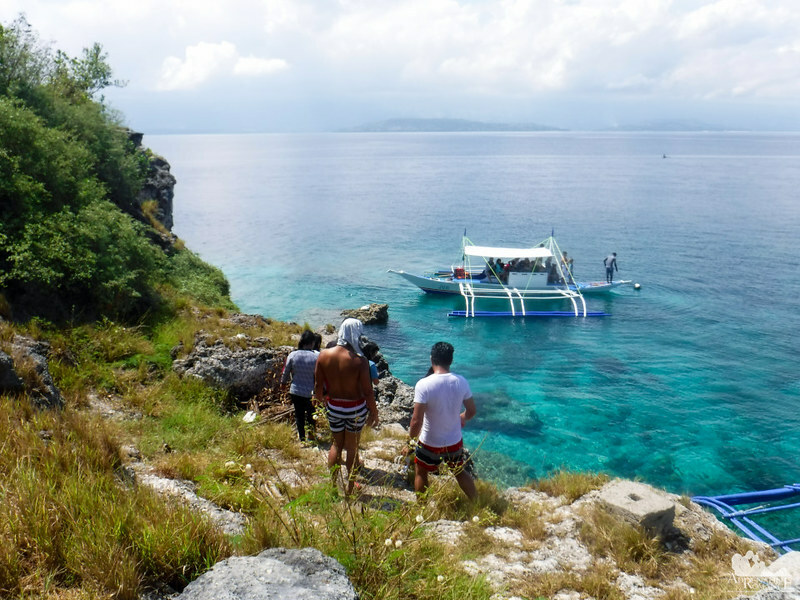 We arrived at the northern edge of Pescador Island where another group of pumpboats—and tourists—are enjoying the crystal waters. Later in the day, the island will be surrounded with pump boats carrying loads of snorkelers and divers. Easier access to the island in the form of crude steps are found here. Of course, this part of the island offers a picturesque 180-degree view of Tañon Strait as well as Cebu and Negros islands. According to web sources, there is supposed to be an entrance fee here, but no one asked us for a fee when we docked. Probably it was incorporated in our boat fare or the personnel tasked to collect the money hasn’t arrived yet. The proceeds are used to finance various marine conservation programs that are spearheaded by Moalboal’s LGU and the Moalboal Dive Center Association. 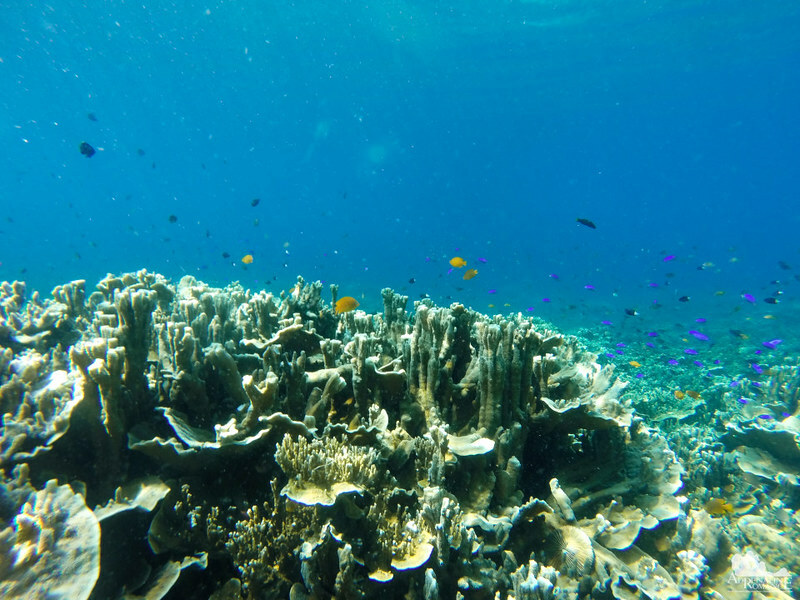 One of the best things about Pescador Island is that there are coral reefs all around the island. And the reefs are shallow; you can witness their majesty just under 10 to 15 feet of water. Thus, snorkelers and divers will have the time of their lives without having to exert a lot of effort or air. 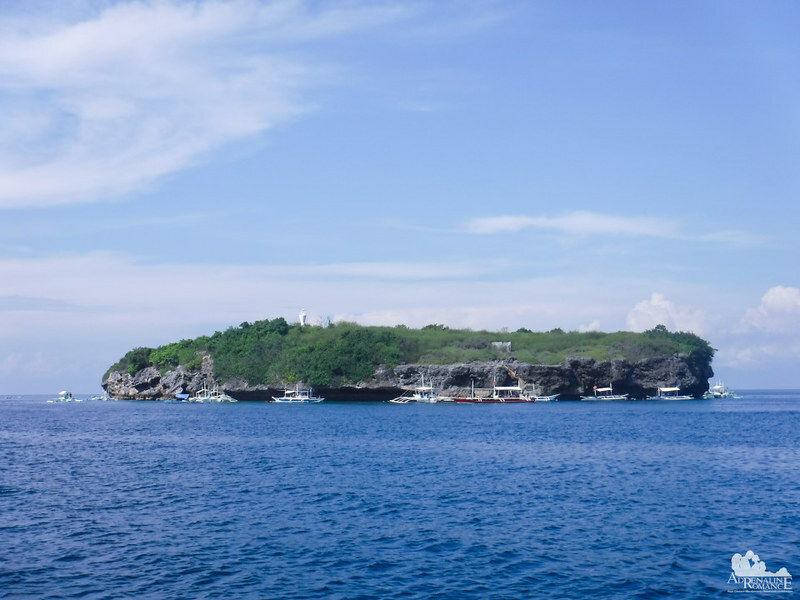 Pescador Island is a lonely, rocky island that sits at the south side of Tañon Strait. The strait, which is around 161 kilometers long, is one of the richest marine habitats in the country. It is home to various species of whales, porpoises, dolphins, sharks, rays, turtles, and other large marine animals, some of then highly endangered. In fact, many fishermen and tourists who start their day as early as 6 AM encounter pods of dolphins playing on the water’s surface. We would love to do that. That would be a really awesome experience! Many areas of the Pescador Island are high, some reaching 50 to 60 up. These cliffs make perfect spots for daredevil cliff divers. 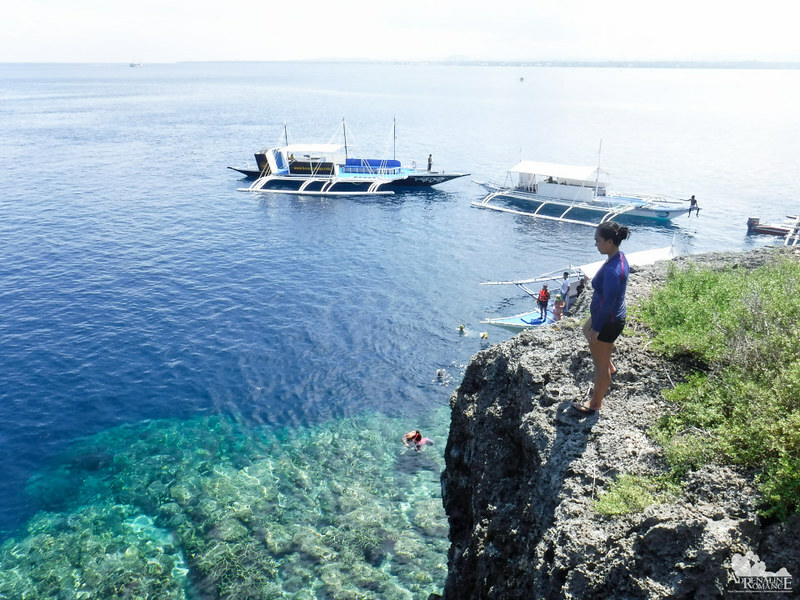 These local teens have the perfect time of their lives as they coaxed each other to make the jump to the deep blue waters below. After spending about an hour in watching the peaceful seascape and cheering the teens to jump, we decided to head back south to where our boat was docked. We de-fogged our masks, slipped on our flippers, entered the water. It was now time for us to take a dip and check out the underwater world! We were already expecting an extremely vibrant reef; we could actually see its richness from the surface. But the beauty, no matter how expected it is, still takes our breath away (pardon the pun) when we dive in. 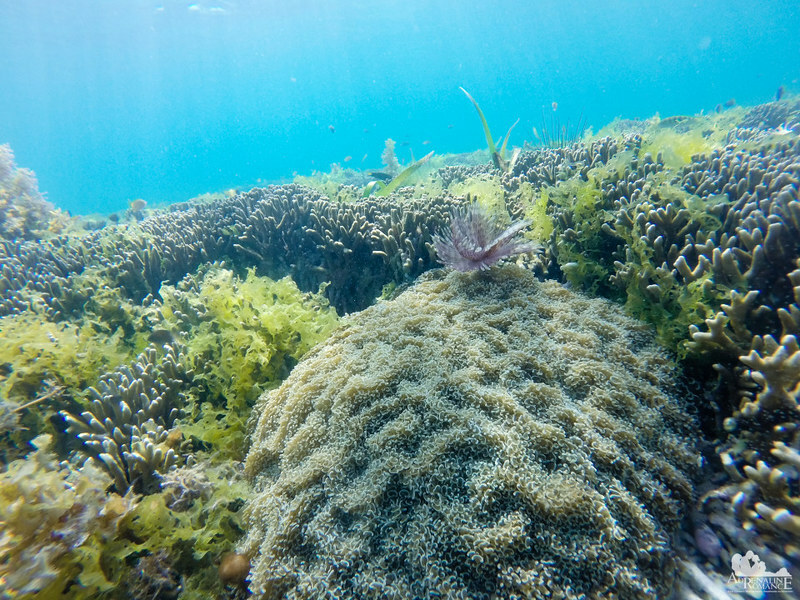 Healthy and huge corals like these provide shelter and hunting grounds for fish. Lots and lots and lots of fish like these tiny blue damselfish. Know that this is just the shelf of the island. The deep kantil that surrounds Pescador Island harbors even more marine treasures! Even in more shallow water near the island’s rock wall, there are multi-layered table corals growing large and healthy. 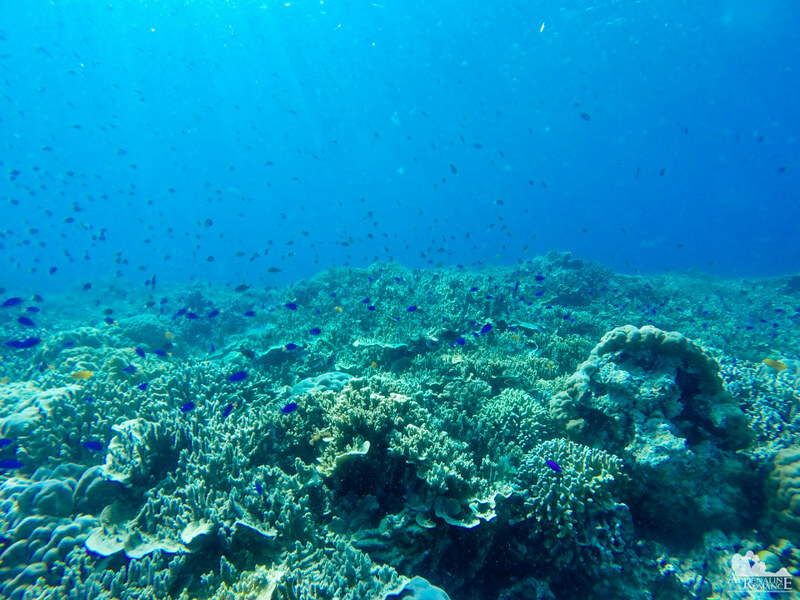 The fish that inhabit these corals are quite used to people, and some curious ones even swam up to my GoPro’s lens for a closer look. Large clusters of soft corals also thrive in Pescador. 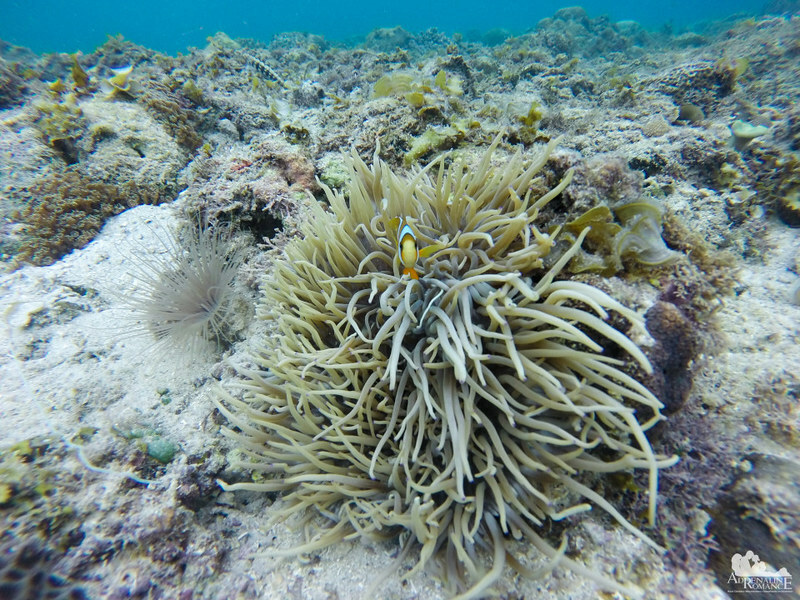 This one even has a nice relationship with a feather duster tube worm. The delicate fan-like plume is actually its gills. 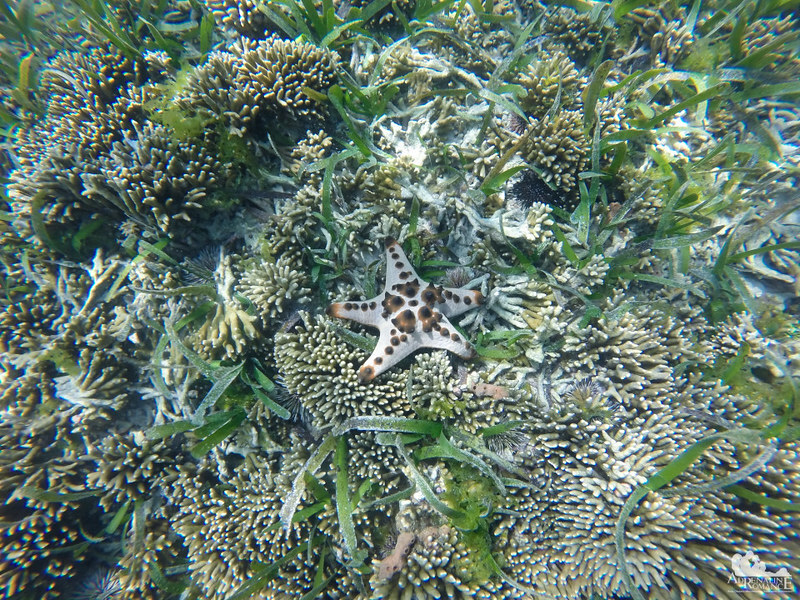 We also saw sea stars of every shape and size. This large sea star was crawling slowly on the coral bed, searching for its breakfast in the form of a yummy clam or oyster. Clownfish are ubiquitous denizens of a tropical reef system. In almost every snorkeling or scuba diving trip, we always find these colorful fish. This nervous one retreated to its protective anemone while keeping a baleful eye on me as I swam closer. In the background, barely discernible along the kelp, a lizardfish thought I was a competitor and swam away to a better, more isolated hunting ground. Another species of sea anemone—yes, the almost transparent one with the thin tentacles—waves in anticipation of an unaware prey. The dazzling underwater kingdom under the waves of Pescador is exceptionally vibrant. Fish, corals, crustaceans, mollusks, and other marine animals all form a rich diversity in the island. Bigger predatory fish, sharks, and dolphins sometimes visit the island; encounters with these rare creatures are truly treasured moments. 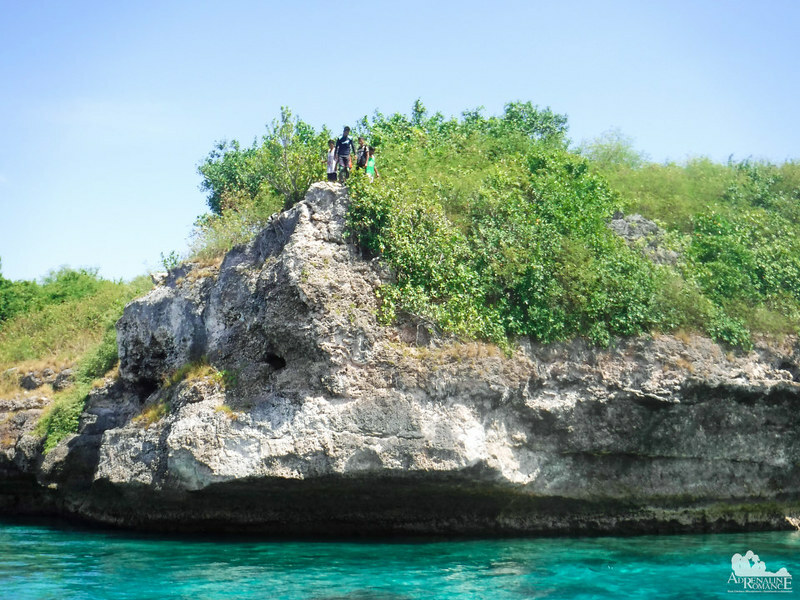 Thus, it is no wonder then that Pescador Island is so well known all around the world as a favorite haunt for snorkelers, free divers, and recreational divers. 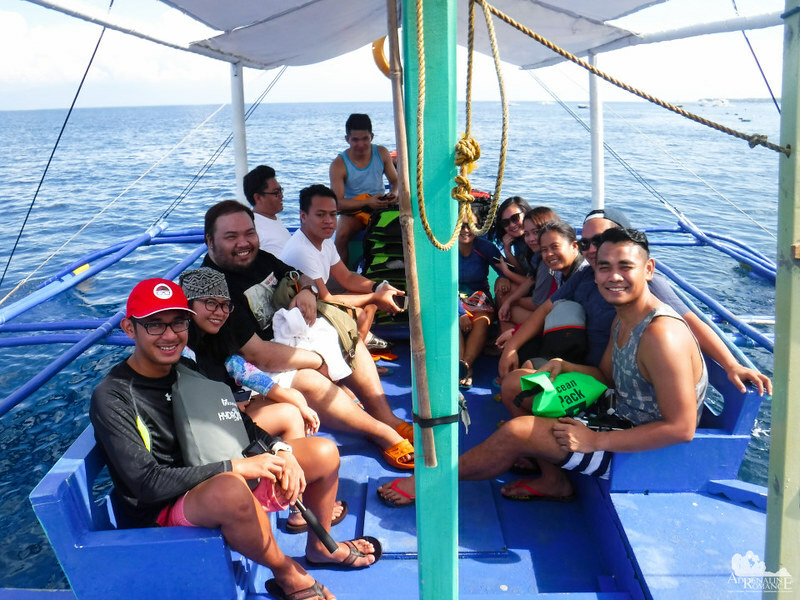 Our first experience scuba diving in Pescador Island a few years ago was not exactly pleasant due to bad weather, absence of a red filter on our GoPro, Sweetie’s inexperience in buoyancy, and the severe damage of a reef section due to a recent storm. However, having a new look of Pescador Island in this trip, Sweetie and I decided to definitely return and dive here. Who wants to go with us? The slow current soon brought an infestation of jellyfish. Jellyfish stings caused us to discontinue our snorkeling adventure much to our disappointment. We would have wanted to stay there and explore the west and eastern reefs, but as always, safety should be the first priority. After all, no one wants to suffer from red, itchy welts on their skin. As we cruised back to the mainland, we saw the teens moved out to another cliff to check out. Wow! That should be around 30 to 40 feet. 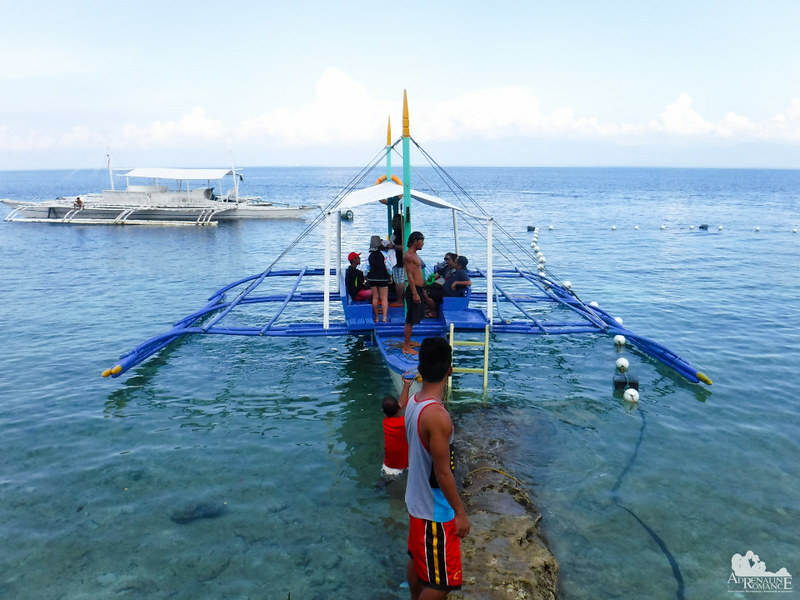 Before we headed back to Cabana Beach Club Resort, we stopped by Talisay Point, a popular dive site in Moalboal’s coastline. In addition to beautiful corals and expansive sea grass beds, the site is also well known for its shy residents—sea turtles! The site is quite big, so we had to hunt for around 15 minutes, scanning the coral beds below us. Suddenly, one of the boatmen waved at me excitedly. Instantly, I knew what he found, and I excitedly swam towards him. 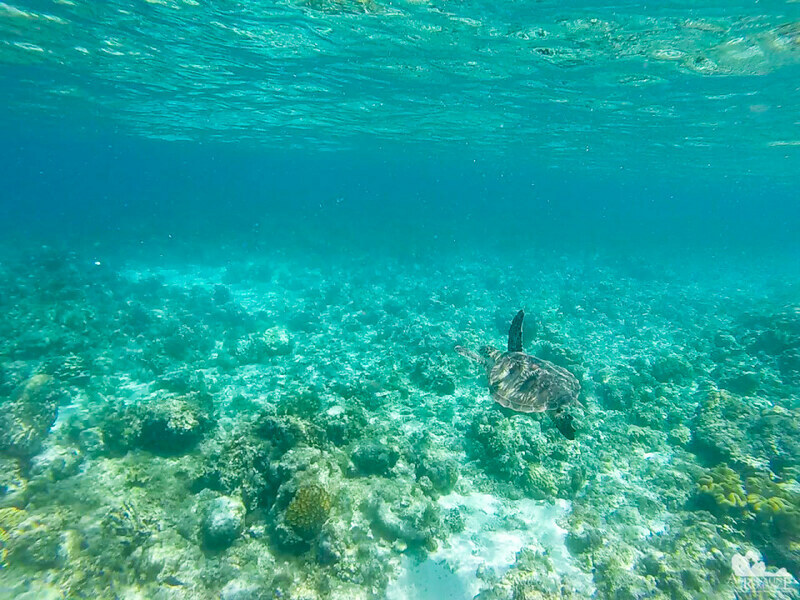 Sure enough, right below us was a large and beautiful green sea turtle feeding on the sea grass and sponges. 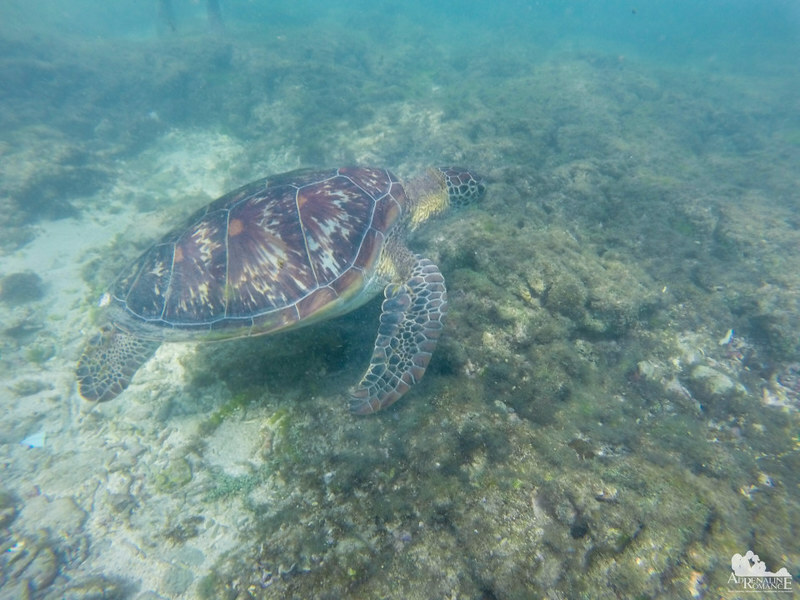 Green sea turtles are classified as endangered species, but they thrive and enjoy their freedom here in Moalboal. I dived down so I can get a closer shot of the turtle’s sleepy face. Startled by my presence—and she must have thought that I’m going to eat her—the turtle began to swim swiftly away. Jose, I, and the boatman gave chase to the turtle, hoping for her to breach so I could take a shot of its face. She swam in circles before she headed to the edge of the kantil and into the blue. Like soaring eagles, sea turtles are very graceful when they swim underwater. That is why we feel sad about turtles in captivity—being denied of their freedom. We would like to thank the fun-loving and adventurous bloggers, vloggers, and social media influencers of Cebu for coming with us on this adventure. You are a great group to be with. Thank you too to Cabana Beach Club Resort for arranging our trip to Pescador Island. 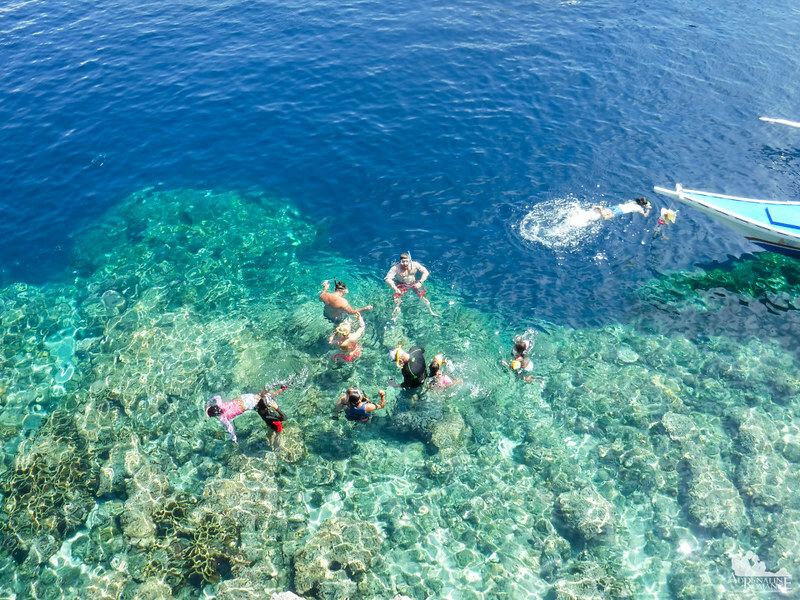 In every way, Pescador Island silently beckons those who have a heart for the sea–the blue world around us. And this small but irresistible water paradise is waiting for you. P 110 per person – one way, non-aircon bus from CSBT to Moalboal (P130 for aircon bus). The same rate applies for the return trip. P 25 per person – one way, tricycle fare from Moalboal to Panagsama Beach. The same rate applies for the return trip. 1. We recommend starting your island hopping adventure early in the morning where there aren’t many tourists. The charm, serenity, and the feeling of oneness with nature disappears when there are too many visitors around. 2. Additionally, rare marine creatures such as sharks, rays, and dolphins often visit reefs or emerge during early morning (or dusk). You have a bigger chance of encountering these majestic animals if you start your adventure early. 3. To get to Pescador Island, you need to sail across Tañon Strait which could be quite choppy during bad weather. For safety, your outfitter and even the boatmen themselves have the right to cancel your trip if they think it’s dangerous to sail. 4. Be careful when snorkeling or diving in Pescador Island because at times, there are currents that can carry you to open water. Currents may be barely noticeable or immensely strong. Ask your boatmen to position your boat in places where there’s less or no current. 5. For non- or novice swimmers, it is advisable that you wear a PFD (life vest) when swimming and snorkeling around Pescador Island. The island is totally surrounded with a wall that is more than a hundred feet deep. The island’s shelf is around 10 to 15 feet deep. 6. 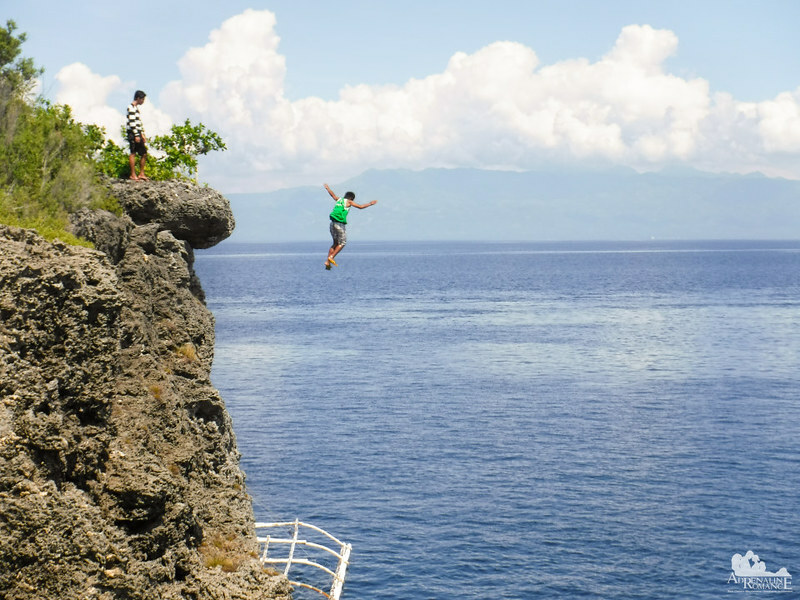 Wear strong-soled sandals or shoes when exploring Pescador Island. The hard coral rocks are extremely sharp. 7. Be careful when walking along the edge of the island. The sea cliffs range between 10 to 60 feet in height. 9. Waterproof your stuff by placing them in plastic bags, dry bags or pouches, or plastic tubs. 10. 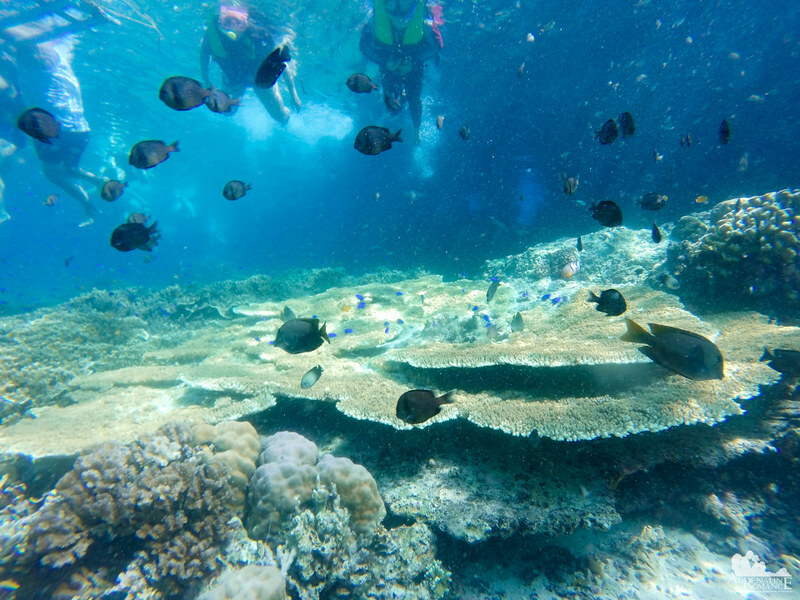 Do not to touch or step on the corals when snorkeling, swimming, or diving. Corals are very fragile. 11. Do not scare fish and other marine organisms. Never touch them; many marine creatures are poisonous or aggressive! 12. Remember to Leave No Trace of your visit. Do not litter; place your garbage in a large bag to be taken back to the city for proper disposal. Do not take any rock, plant, sand, that belongs to this paradise. This is just fabulous. Those photos are so clear! So Jealous you got the chance to step on the island, I’ve been to Pescador countless times, yet, still not able to walk through what’s inside the small place. Love that you showed a photo as well. If you don’t mind, what camera are you using? The photos underwater are stunning! Best regards, Ace and Demi. Thank you very much for the kind words! Regarding your question, for ground photos, we are using a waterproof Fujifilm XP90. Great! Those babies are reliable. 🙂 Thank you for the prompt response. We agree. But we are planning to upgrade a bit to GoPro Hero 4 Silver. It has a screen so that we can see what we’re shooting. 3) it doesn’t function as well as the Hero 4 underwater. Specifically, the buttons won’t function as you go deeper. Yeah. It’s quite difficult to find it actually. 😦 We are checking out GoPro FB groups if they have some second-hand units for sale. Nice spot for snorkeling! Those dolphins that may be observed at Moalboal are probably the same ones that are found in the Tanon Strait just off Bais in Negros Oriental. When we went there our boat was actually closer to Cebu than Negros when we saw the dolphins. The water is so clear it’s amazing. I love the sea anemone, but for me the turtle is my favourite. I was lucky enough to swim with them in Mauritius. It was an awesome experience! Phillippines is one of those countries that the more I see about it, the more I want to go. I don’t think I’ve ever seen anything about Pescador Island before this post. Looks really nice. Never been to the Philippines yet, but this article really tempts me! Oh my goodness, this is an amazing post! So much good information. And I completely agree about the call of the blue water. Our family gets restless if we haven’t been in salt water in a few months. I’m trying to convince the husband we need to move somewhere where we can see the ocean from our windows. Thank you! 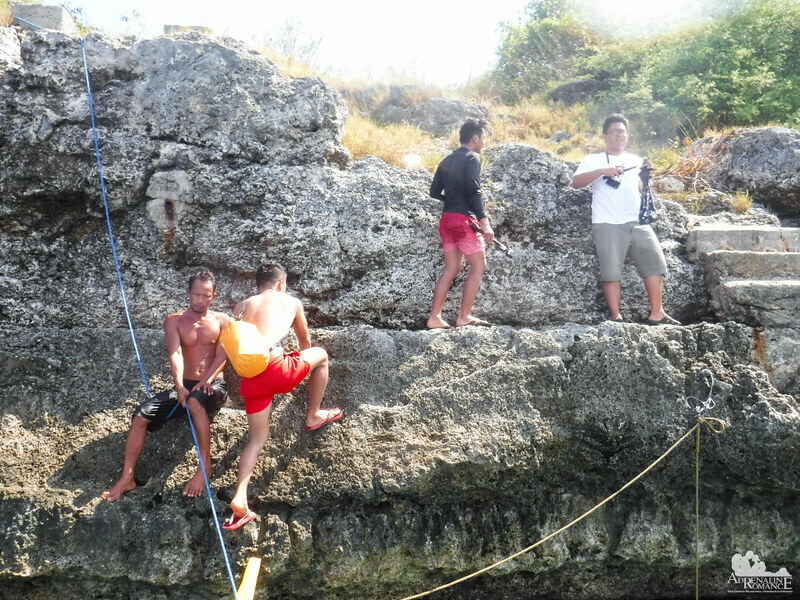 Actually, there are a whole lot of island hopping adventures that you can do in the Philippines. Click this link to check out more island hopping adventures in the Philippines. The underwater world there looks fascinating. Thanks for the tips too, very helpful. I guess my bucket list is getting longer…. Awwww, don’t be sad. 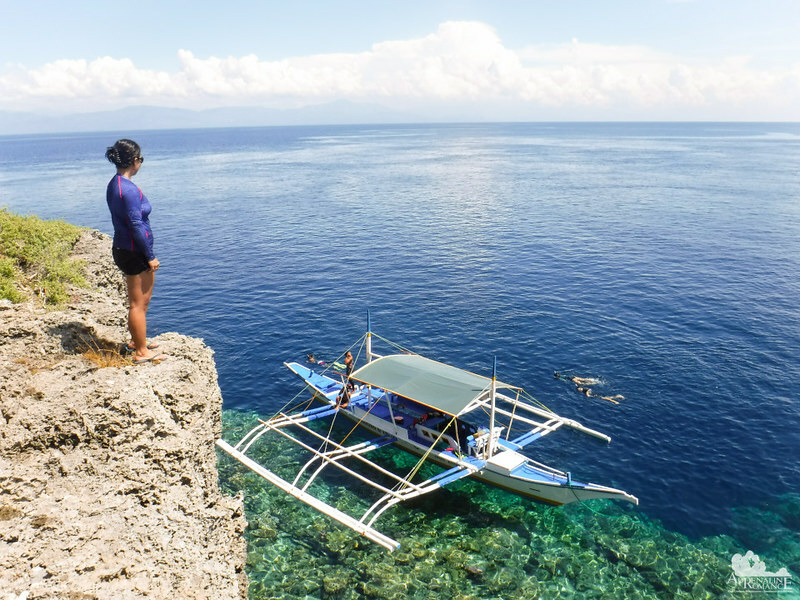 If you have the chance to visit Cebu, Philippines, include visiting and diving in Pescador Island in your itinerary. It’s really amazing that there are so many things in this small place. Yup nobody lives there save perhaps for the occasional maintenance personnel who periodically checks the lighthouse. I’m in love with the pictures of the cliff and the crystal clear water below. That is one incredible diving location I can see. And it is really great to read that an endangered species like green sea turtle has a good environment to live. Indeed! 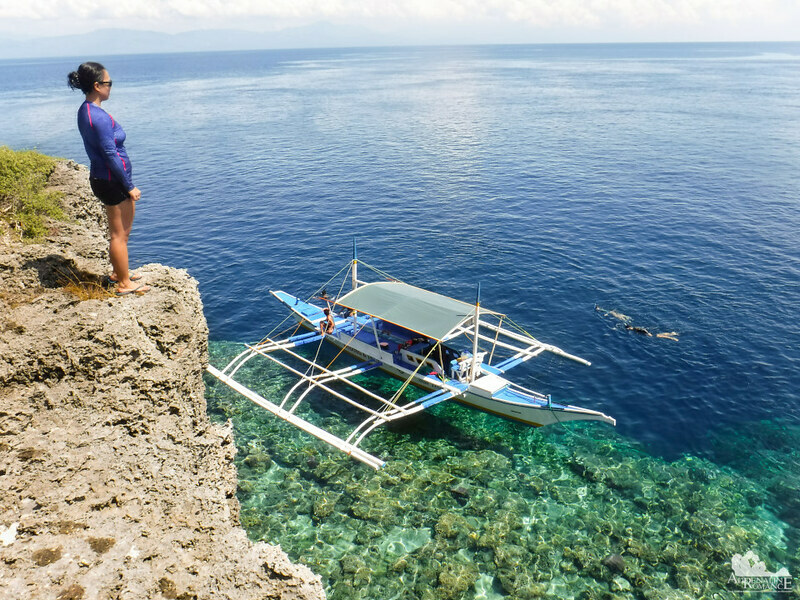 We plan to dive here again in Pescador Island; our first dive here a few years ago was not a pleasant experience mostly due to bad weather. Hi Gian and Sheila, this is Megan from Visit Cebu. We’d like to share your photo for one of our articles–we will of course give the appropriate credits to you. Just let us know if you wish to have it taken down. Thanks!